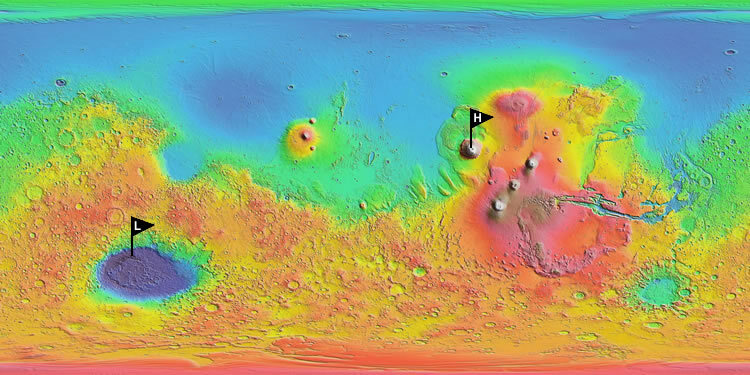 The image above is a colorized topographic map of Mars. This Mercator projection map shows low elevations as a deep blue color and high elevations as a white color (see elevation scale below). The map was prepared by NASA and is based on data from the Mars Orbiter Laser Altimeter, an instrument on the Mars Global Surveyor spacecraft. The highest point on Mars is the Olympus Mons Volcano (marked by a flag with the letter “H”). The peak of Olympus Mons is 21,229 meters (69,649 feet) above the Mars areoid (a reference datum similar to Earth’s sea level). The lowest point is within the Hellas Impact Crater (marked by a flag with the letter “L”). The lowest point in the Hellas Impact Crater is 8,200 meters (26,902 feet) below the Mars areoid.